Holder tweet Sunday calling for the reunification of children separated from their parents at the southern border attacking Trump Adm…. 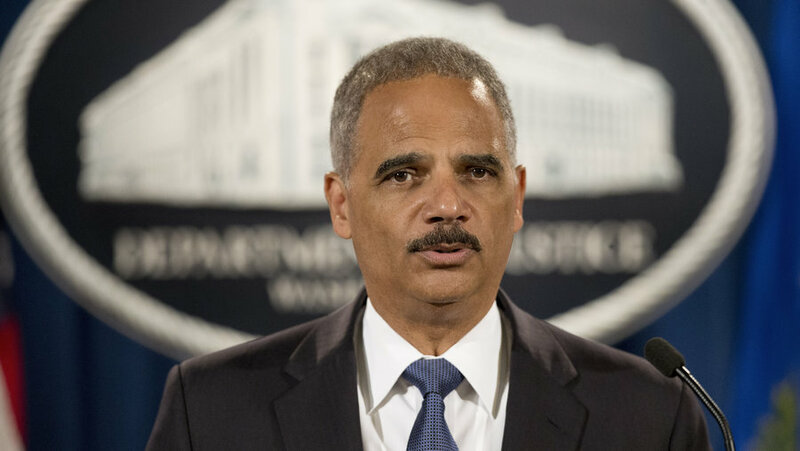 (FreeBeacon) Eric Holder cited President Franklin D. Roosevelt, who ordered the forced removal of more than 100,000 Japanese-Americans to internment camps during World War II, in a tweet Sunday calling for the reunification of children separated from their parents at the southern border. The Trump administration was fiercely criticized for implementing a “zero tolerance” policy of separating illegal immigrant parents and children at the southern border. President Donald Trump has since reversed the order, but there are still a significant number of eligible children who have not been reunited with their parents. Holder’s invocation of Roosevelt was curious, given the 32nd president signed an Executive Order in 1942 that ultimately resulted in the internment of some 112,000 Japanese-Americans, the majority of whom were second-generation U.S. citizens or third-generation children. His order, which came on the heels of Japan’s surprise attack on Pearl Harbor in 1941, authorized removing people from military areas “as deemed necessary or desirable,” Politico reported. The Pentagon defined the entire West Coast as a military area, and the U.S. Census Bureau helped by providing names to the Secret Service of those with Japanese ancestry. While parents and children were not separated when they were interned, Quartz reported there were cases of individuals incarcerated for speaking out against the government and imprisoned separately from their families. Roosevelt is often revered by historians as one of the country’s greatest presidents and a progressive icon, but the internment of Japanese-Americans has long been considered a black mark on his record. As usual, he’s a day late, we have moved on from this. Man does not stand a chance, he has the personality of a rock. The country elected a illegitimate Kemyan twice. Unless Trump starts producing on many of his promises, 0care, tax reform, deportations, the wall, debt relief, balanced budgets, law and order, etc. etc., I feel he may just lose enough of his nationalist base for a snake like Holder to win. Just like the Big0 he has the right words, but they don’t mean what we think they do. “Freedom” is really the 3rd world miscreants replacing “whitey”. And the award winning joke is; ERIC HOLDER. None of these people should be allowed in front of a mic or TV camera. There all just part of the Dog and Pony show. It’s tiring and boring. And the idle threats from Nunes, Gowdy, Grassly and the rest saying contempt or else. Still no unreadacted documents and no one is going to jail or even fined. As for the Illegal kids, many of them don’t belong with these people, many have left leaving their kids behind. Democrats, Liberal’s, Globalist don’t give a damn about these kids and could care less, just an excuse to run their mouths and get some prime time media BS. The root causes of the Progressive Movement need to be dealt with and Holder knows the American youth do not know their history, not can they think critically. They understand negative information directed at Trump and dutifully do as they’re told- to hate him and oppose him with Democratic votes. Holder has his eyes on Washington as the next answer to the continuation of Obama’s work. Can no one stop Obama’s underground undermining of the United States President? Raiding their offices sounds like a good start. What are the steps needed to do it? this CRIMINAL AND TRAITOR HAS NO ROOM TO ATTACK ANYONE LEAST OF ALL OUR PRESIDENT.